A hands on way to teach your kids about honesty. 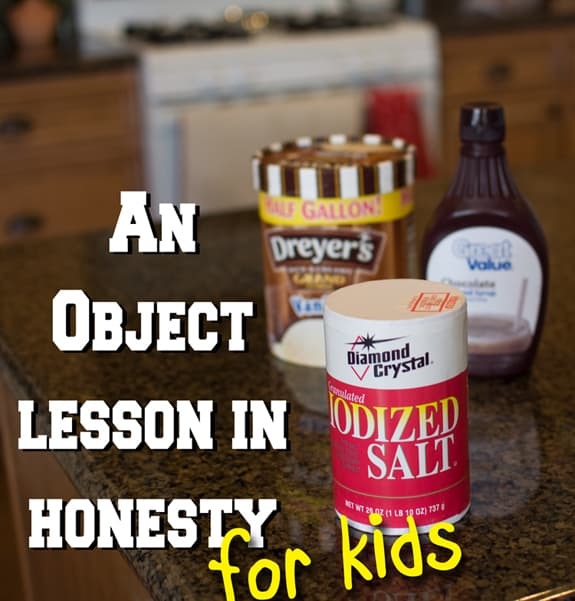 This Object Lesson for Kids on Honesty opens up great dialogue and will be a lesson your kids don’t forget! The other day I was thinking about how I could help my kids understand honesty better. While they understand what it means to be honest, I think as kids their little minds think that lying can actually change the truth. I came up with this idea for a Family Home Evening lesson to help illustrate how a lie doesn’t cover up the truth. To prepare in the morning I put a little water in one of my bowls and then I added a bunch of salt. I let it dry and also used a blow dryer on it to help the salt harden in the bottom. I added another layer when the first dried and did the same thing to make sure it was thick and hard. 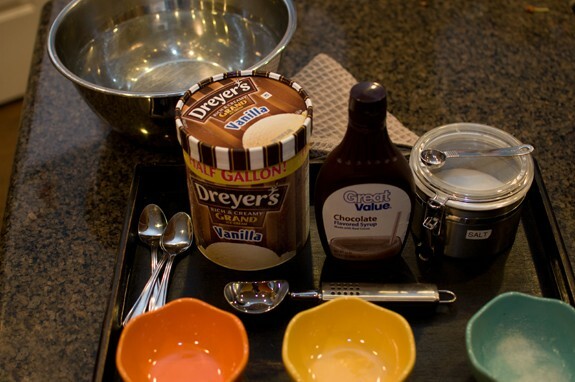 That evening I took my tray out that had the ice-cream, salt, chocolate syrup and bowls on it. The boys were so excited to see ice cream and chocolate syrup for our lesson! I dished a scoop of ice cream in a bowl and handed them each a spoon and asked them who liked ice cream. They were so excited! I said that sometimes we make bad choices. What about putting salt on ice cream, would that be a good choice? They said no and I took about a teaspoon of salt and sprinkled it all over the top of the ice cream. I made a big deal out of it saying oops! Then I said sometimes we are embarrassed about the choices we make, so we try to cover them up with a lie. At this point I took the Hershey syrup and covered all the salt with the ice cream. I then asked them questions like, can you see the salt anymore? How does it smell now? How do you think it would taste? I took their spoons and gave them each a spoonful of the ice cream and syrup. I made sure to take shallow scoops of ice-cream, so there would be lots of salt on their spoonfuls. I asked who wanted to try it and shockingly they all did. I really think they thought you wouldn’t be able to taste the salt. Be prepared to laugh at some funny faces! I said that’s how lying is — we try to cover up what we did that was bad, but it doesn’t really go away. The only way to get rid of the salt is to start over and go back and make our mistake right. I took the second bowl and added a little salt to it. I told them that when we tell a lie we can go back and make it right. I had them take a paper towel and had them easily wipe the wet salt out of the bowl. Then I took the bowl with salt dried in it and said sometimes we have told a lie a long time ago and everyone has forgotten, but we don’t. Sometimes the lies build up because we have to tell more lies to cover the first one we told. I talked about how the longer you let it go, the harder it gets to tell the truth. I let them try to swipe the dried salt away with a paper towel, but it wouldn’t come off. I took the big bowl of water and talked about how we need the Savior to help us make it right through repentance. 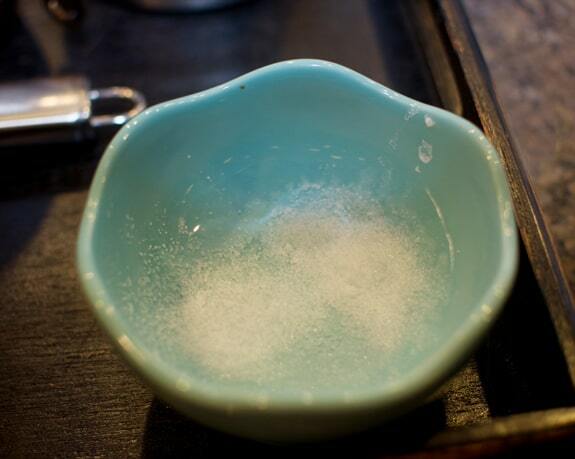 Then I took the bowl with the hard salt in it and put it in the big bowl of water and swished it a few times and the salt dissolved. We talked about taking the sacrament each Sunday and how that reminds us of our baptism and how each week we can be washed clean. The boys were mesmerized during the whole lesson – no fighting or whining! Yay! After we were done with the lesson, we dished up ice cream with syrup and had that for our treat. They have referred back to the lesson a few times, so I know it made a difference for them. I love when a lesson actually gets through to them and opens a great discussion! Hope you and your loved ones have a great lesson too! Speaking of this rough job, called parenting! Here are some tips and tricks that have helped my house run smoother! If you love this lesson, I’d love it if you pinned the image below, so others can find it to! I think it’s terrible unless the kid has actually done something wrong. Either than that I wouldn’t want my kids to hate me for giving them salt with ice cream for no reason at all. Um, I’m pretty sure that she wouldn’t have felt the need to do it unless lying was already an issue. SO yeah. And even if it was for “no reason at all”, they’re kids. It’s ice cream. They’ll get over it. sometimes it’s better to teach in advance so they don’t have to feel guilty the whole time. then when the need arises, you can refer back to your awesome object lesson. once they’re in trouble, it’s not really the time for ice cream. I know a boy who dipped his french fry in ketchup and then in icecream for no other reason than the fact that everyone else thought it was gross. The mom here tasted it first and reacted to it before asking the boys if they wanted to try it. She didn’t make them from what I can tell. They may have been grossed out, but most boys I know (kids, for that matter) enjoy that. And they got the point. Children will remember what they do and tie it to the lesson a lot better than they remember what YOU do. When these boys think of lying, I bet they will remember the taste of salt in their icecream more than they will remember their mom’s disgusted face. Apple this was not a punishment for the children but a creative way to help them concretely make a connection to an otherwise abstract concept. The salt is part of the object lesson! It is a teaching tool not a punishment! They didn’t eat it with salt on it… they only tasted it! They ate good ice cream after the lesson!! Did you read that carefully? She asked the boys if they wanted to try it. Really! Your worried about your kids hating you for a little salt?! You have issues. It is called teaching real life. Don’t you want them to avoid the real salt later in life ? If parents were more concerned with teaching their kids right from wrong less concerned about upsetting them or having them hate you – our world would be a better place!! Give your kids more credit than that! The kids knew the icecream had salt in it. She explained the analogy and the whole point to them. They wanted to try it. I think this is a GREAT lesson to teach on honesty!! This ‘Apple’ person must think that everyone should treat children like they are full grown adults who don’t need to learn anything in a positively constructive manner. You are one of those people who think the best way to discipline children by doing nothing at all because you don’t want to stifle their ‘creativity’. But all you are doing is making them pompous jerks who think the world will revolve around them while others are supposed to be at their beck and call. I hope your children don’t bite the ‘Apple’ so much that they only leave a moldy brown core behind. I don’t even have children of my own yet, but I do feel that this was a very great lesson for them and a creative way for them to understand how lying can effect others and even themselves. Apple, if you consider the alternative, learning from your lies is an extremely painful process… gaining back trust from those you’ve hurt, feeling the shame of pretending to be someone you’re not, etc. Isn’t it so much more helpful (and less painful) to teach your kids a fun lesson in advance to avoid some pain? This is an extremely loving experience. No one was forced, and most kids enjoy trying something weird or gross because it’s funny! I am a bit put-off by all the negative and hurtful responses to your post. There is nothing productive about them. Obviously you have an opinion you feel is important. I disagree with it because I don’t think you are seeing the bigger picture in this area. As far as your kids hating you for it, it seems like you are letting your fear of their disapproval of you hinder you from really teaching them as kids, which will only make things harder later in life. Kids naturally crave time and approval from their parents. A little discipline with hugs and attention included, or some preemptive learning time for future lessons as this is, will only get you much closer to your kids than letting them have only things they like all the time. I don’t think you’re saying you don’t discipline, but this is a simple thing to hopefully minimize discipline in the future, and maximize fun family time spent together. Thanks Lisa, for a fun and helpful idea! I 100% agree. Nothing wrong with this lesson. A bit of ice cream with salt wont hurt the kids and they wanted to try for fun, and they learned a valuable lesson. Come on, get over yourselves! Grat job! Apple, It’s a scenery lesson, something that they can draw on later. Like if they go to tell lie they will remember the taste of the salt with the sweet. Each piece of salt is like a little lie and as you keep adding more lies (salt) put together makes up one big lie (the saltier it gets) that can damage people’s lives, families, careers & friendships and it’s harder to cover them up. Children we have to teach the lessons when the opportunity shows it self and do it with love. Those last the longest. And you aren’t forcing them to eat the bowl of salt, it’s a taste or the bitter with the sweet. That’s why there are four bowls. If you based your parenting on whether your kids will like you or not that is not good parenting, because parents are going to be hated sometimes for setting limits and boundaries. Yes and no. Basing your parenting on being liked is a bad idea, but parents do NOT have to be hated for setting boundaries. We set boundaries with love and empathy, and care very deeply about how our children feel about us. It’s not one or the other. I so agree with this comment. There will be many times your kids will hate you for whatever reason, but we are there to guide them with love, we are not their bodddies we are their parents. Seriously? If you read it, you would have seen she told them there was salt in it. awesome! thanks so much for sharing. My boys need something like this. Thank you for this! I found you through an fhe search. 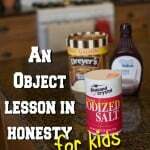 My daughter has a hard time not sneaking icecream and sweets so this is perfect for teaching her honesty! what a great site you have! Keep it up! This is amazing! Found this on Pinterest! What a great idea!!! This is awesome. I am going to do this with my daughter. Wonderful! Did this last night and my 5 yr. old daughter really thought because the salt was ‘covered up’ that you wouldn’t be able to taste it. Wish I had thought to have the camera ready! Boy that was funny! Included a few strories from the friend and referenced an episode of Veggie Tales. Great lesson and I hope it’s remembered for years to come! We did this tonight. We read a few scriptures about being honest/lying….and also watched part of Aladdin to illustrate the salt that was heated to the bowl. The part where genie tells him to tell her the TRUTH! Fast forward through the song to where jasmine says oh too bad abu missed this and then aladdin proceeds to lie more to cover his lie. They loved it, esp the ice cream 😉 thanks! What a great idea to show that scene from Aladdin! Love it! This is really cute! Thanks so much for sharing it. We will definitely be doing this lesson at our house for FHE. this is brilliant. I’m going to try this on Monday night! Fantastic. I LOVE lessons that keep them focused (I have 4 boys). Great application. found this via Sugardoodle.com’s facebook page. What a great lesson! I’ll be logging this one away for sure. thank you! Great object lesson! Wish I’d had this when my guys were little, they are now 22 and 19. Will definitely look for an excuse to use this activity.